If you click with MORI, then you are going to find one of your favorite films of the year. If you don’t click this is still going to be a good portrait of a day in the life of artist. Morikazu Kumagai is 94. His wife of 50 years is 76. They really haven’t gone out in 30 years, but that doesn’t mean they don’t experience life, as everyday they go through their paces cooking, cleaning, painting and observing life all around their property. A mannered and low key celebration of life, this pastorally paced film is going to delight many with its slice of life take. 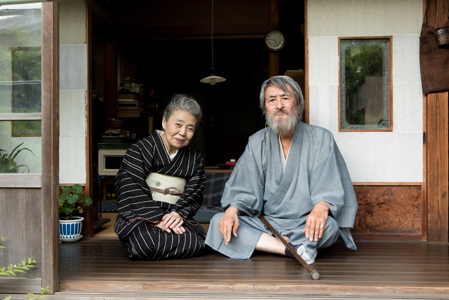 We really get a sense of the slow paced rhythms of the life of Mori and his wife. Scenes seem to play out in a kind of real time as life happens and people talk around them. In a scene certain to slit audiences Mori goes out and wanders through his garden and just observes. On the face of it nothing happens, but everything does. We see the artist's sense of wonder. We get a sense of how the observations fuel his love of life and understanding of everything. By the time the film is coming to a close and the couple are discussing life, she wouldn’t want to live the life over, he is nowhere near done and wants to keep going forever we completely understand why. It is a wonderful bittersweet moment that is as glorious as anything you’ll see all year. I loved this film a great deal. It delighted me and touched me with its sense and desire of life.